The world's first commercial hyperloop system, which is set to open in Abu Dhabi in 2020, will cost between $20 million to $40 million per kilometre, said Bibop Gresta, chairman of Hyperloop Transportation Technologies. In an exclusive interview with the Emirates News Agency Wam, Gresta announced that Abu Dhabi's Hyperloop capsule has left the assembly facility in Spain to Toulouse, France, where it will be tested and optimised, adding that this first-of-its kind project in the world "can recoup the investment in 8 to 15 years". The first phase of the project involves construction of 10 km out of a 150-km system between Abu Dhabi and Dubai and is set to be ready next year. In April 2018, HyperloopTT signed a memorandum of understanding with Abu Dhabi's Aldar Properties, which, when executed, will allow for the creation of a new Hyperloop TT centre including, a full-scale commercial Hyperloop system, an Hyperloop R&D Advanced Mobility Centre, a Demonstration & Visitor Centre, and an Innovation Hub. The proposed HTT site within Aldar’s Seih Al Sderieh landbank is also conveniently located on the border of the Emirates of Abu Dhabi and Dubai, close to the Expo 2020 site and Al Maktoum International Airport. "It was a far-fetched dream, but we are all excited now that it’s a dream coming true in the UAE in 2020," Gresta said. "Today we’re announcing that the capsule has already left the assembly facility in Spain, and is on its way to Toulouse, France, where we have a prototype track. As soon as it arrives in Toulouse, it will be put in a tube and then they will test the system with the first passenger." "An average cost generically comes between $20 million (Dh73 million) to $40 million (Dh147 million) per kilometre," Gresta said. "When you build it in the desert, it is different from building it in Switzerland. However, the second question we need to ask is how long does it take to recoup the investment? This is a topical question because no one transportation system on the ground recoups its investments. They always need subsidy." "But in Hyprloop, we can recoup the investment in 8 to 15 years; it will be paying for itself and then it will be generating profits for the country. So it is not only fast but also very efficient." 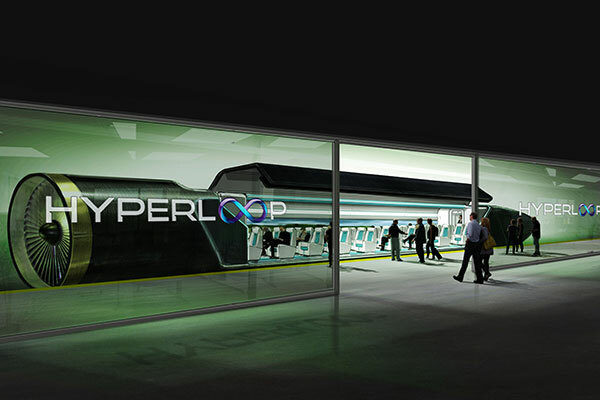 "The Hyperloop system would have a low cost of implementation, as compared to other high speed transportation methods. It is a simpler, lighter weight, and less energy-intensive system," he added. Asked about the issue of safety, Gresta noted, "Hyperloop is primarily built on pylons, using best practices from civil engineering, including seismic design and ability to withstand thermal expansion. Also, it is completely automated with advanced technologies that only require monitoring from humans. The system is electrically powered, with no need for fuel on board, and is protected from the environment." "We have developed tiered emergency plans and redundant escape procedures and systems in the event of any incident. The HyperloopTT’s system was deemed 'feasible and insurable' by the world’s largest reinsurance company Munich RE," Gresta concluded.